As much as I’d like to say I accomplished everything I wanted (and more) by the ringing in of the new year, a small stack of unreviewed new releases decorating my home office might suggest otherwise. Among the albums I wasn’t quite able to get to in December was a pretty impressive one from 30-something Canadian singer-songwriter and guitarist Matt Andersen; if you haven’t heard of him, you may want to add checking out his new Coal Mining Blues (Busted Flat Records) to your list of resolutions. The son of a Perth-Andover logger, Andersen has a gift for presenting songs that resonate with the masses both lyrically and musically, with sounds that range from the quiet tones of Marc Cohn and Philipp Fankhauser, to The Band, Creedence Clearwater Revival, and Joe Cocker, to the more straight-ahead blues of the Fabulous Thunderbirds and Chicago’s Rob Blaine. The first Canadian to win the Blues Foundation’s International Blues Challenge (2010), he also surrounds himself with some strong company on instruments and backing vocals. Recorded at Levon Helm’s studios in Woodstock, N.Y., Coal Mining Blues, for example, also features The Band keyboardist Garth Hudson and Helm’s daughter Amy on vocals, as well as fellow Canadian Colin Linden, who co-wrote and plays on several tracks in addition to having produced the project. I haven’t yet been able to decide which I enjoy more from Andersen: the soft ballads such as “Home Sweet Home,” the beautiful title track, and the emotionally powerful “She Comes Down” or his more up-tempo numbers like “Fired Up,” the soulful “Heartbreaker” with its horns and intense vocals, and the swinging “Lay It on the Line,” but I’m pretty sure there’s not a thing I don’t like about this record, much of which has a pleasing country blues feel. Kicking off with the catchy guitar and vocals of the shuffling, CCR-sounding “I Don’t Wanna Give In” and the country-rock of “Fired Up,” it isn’t long before we hear a completely different side of Andersen’s persona in the form of the album’s title track. In the style of Marc Cohn and Philipp Fankhauser, the song really couldn’t be more heartfelt, not only in its lyrics and vocals, but also in Andersen’s acoustic guitar and the accompanying keys and horns. A few songs later, the inspirational lyrics of the soft and slow “Baby I’ll Be” are further accented by the superb backing vocals of the McCrary Sisters, followed by a Rob Blaine-like performance on “Make You Stay” that includes some terrrific strumming from Andersen on acoustic guitar, joined only by Geoff Arsenault on drums. Garth Hudson steps in on accordion for the Eric Bibb-ish “Home Sweet Home,” while Andersen displays hints of Darius Rucker, Joe Cocker, and The Band on his vocals for the quiet but commanding “She Comes Down.” The slow country blues of “Willie’s Diamond Joe” (Willie P. Bennett) ventures even further into Band territory, consisting only of Andersen on acoustic guitar and lead vocals along with Linden on harmony vocals and mandolin. Not yet quite ready to call it a day, Andersen rips into a Fabulous Thunderbirds-like “I Work Hard for the Luxury” that credits “Some Handsome Fellers” on backing vocals before putting down the guitar for a closing, Joe Cocker-sounding take on Charlie Rich’s “Feel Like Going Home,” accompanied by John Sheard on piano. 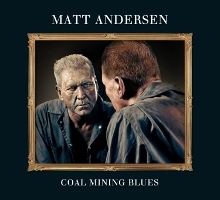 This, of course, is not to suggest that Andersen is without a sound of his own; rather, he is to be commended for his ability to accomplish such a diverse range of styles – and do it all so damn well – in the space of only a dozen songs on Coal Mining Blues. That, combined with Andersen’s recent wins at the IBC and 2011 Maple Blues awards (where he took top prize in both the entertainer and acoustic act of the year categories), is bound to lead to a whole new world of possibilities for Andersen, and we look forward to hearing him play our part of it sometime soon. This entry was posted in Albums and tagged Colin Linden, Matt Andersen. Bookmark the permalink.